I'm willing to say that reading and liking the book might have ruined my chance at loving the movie. It's not that I can't separate my enjoyment of the two medias, can't find both entertaining, can't understand that different visions produce different versions. But, with the novel, I've seen the path that VanderMeer went down, and it was excellent. 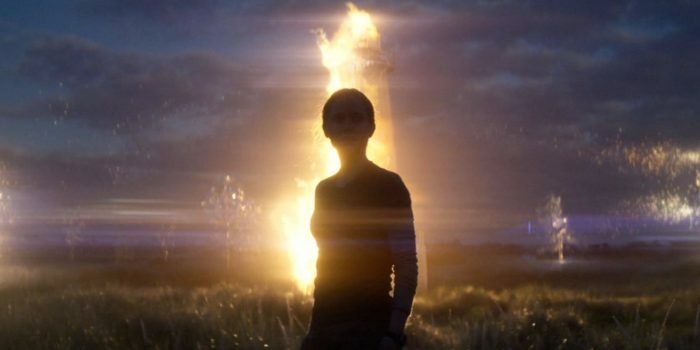 What further complicates the comparison is that audiences claim that the film version of Annihilation is an intellectual dream, a cerebral experience, that it's almost too much of a think-piece for the general public. That's absolutely not true, at least when compared to the book, which actually is all those things, and works perfectly because of it. The film might be quite good, but it is nowhere near as stripped down as its story was originally and ought to be upon every retelling. Lena, who is ex-military and now a biologist, watches as her husband Kane, a special-ops solider, leaves for a top secret mission, one that seems to be bothering him more than his usual clandestine assignments. When he comes back a year later after everyone assumed he was KIA, Lena knows that something went dreadfully wrong, an intuition that is confirmed when her begins acting strangely and then has a medical emergency. Eventually we come to learn that Kane was part of a team that went into the Shimmer, an ever-expanding area of land near the coast wherein the rules of nature don't want to apply, and from which no one ever comes back alive. Lena will head in herself, with a team of four other women, to uncover the secrets the Southern Reach is hiding, and to be changed herself by the experience. The film version tosses in far too many Hollywood elements, far more than the plot needed, and the result is something I enjoyed on the surface but can't hide my disappointment in. Garland, whose only other directorial feature is Ex Machina, a film I thought was the best movie of its entire year, tries his hand at adapting this phenomenal book into a screenplay and then into a film, but he couldn't do it without falling back on a ton of typical elements, and that's a real shame. He didn't need to, we didn't need tricked into liking this story, I know because I've watched it work once before and there was no reason it couldn't work again without major tampering. A romantic side story, sappy backgrounds for everyone on the mission, carnivorous creatures, an unambiguous ending; exactly what about this movie do critics and early-viewers think is so incredibly high above us that only 1% will be able to grasp it? That's my major gripe, and my own problem, I completely understand that; reading the book showed me how this plot could be parred down to bare theory and still be something highly entertaining. I didn't need more, I didn't need Hollywood, but I guess I understand how others did and why they liked that they were led by the hand. Still, it's not a cheap film, I won't stoop to calling it money-grabbing sci-fi, Garland still has a unique vision, and that's what allowed me to rate this movie highly despite my opinions about what should have been done differently. The director moved the plot along very well, the pacing was always nice, and the cinematography throughout was something magical to behold. There were some freaky, jump-out-of-your seat moments, I'm always a fan of Natalie Portman, and this fictional world is so complicated and beautiful, you'll leave wanting to see more. The positives outweigh the negatives, but I can't help feeling slightly surprised and confused by the choices made surrounding the production, can't help wishing Garland had gone full bonkers instead of only halfway. Watch Under the Skin if you want some sensational sensationalism; Annihilation scrapes the surface, copies a little, and aims to please a wider base, which may pay dividends one year from now, which may have been the aim.